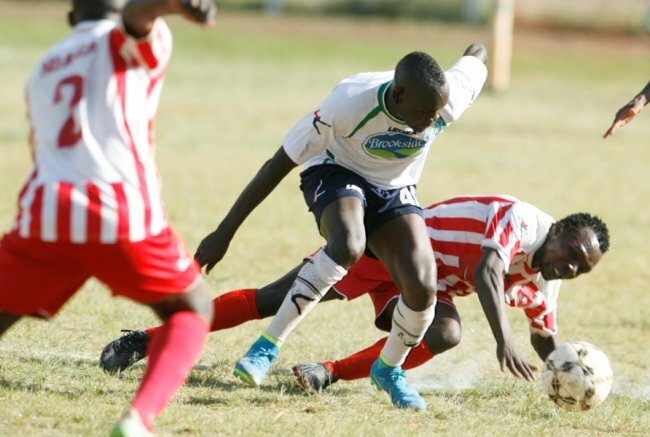 Thika United handed themselves a massive advantage to remain in the Kenyan Premier League with a 2-1 win over Ushuru FC in a promotion and relegation play-off match at the Thika Stadium on Thursday. Fredrick Kentile deflected an Onwudi Chibueze shot into his own net with three minutes left on the clock to hand Thika the advantage ahead of the return leg on Sunday in Narok. The Sports Disputes Tribunal threw out Thika’s petition against the play-off on Tuesday evening and FKF immediately swung in to set a date and ensured the fixture is complete before Christmas. Thika only gathered on Wednesday evening and had less than an hour of training. “It has been very difficult for us because even mentally, the players were not well prepared. We had gone on break already and were only informed of the game yesterday. It was evident that we were not physically ready but I am thankful we could grind a result,” Nicholas Muyoti, the Thika United coach said. Ushuru pressed Thika especially in the second half, but they couldn’t get the winner despite laboring to draw level. Coach Ken Kenyatta has however cautioned it will be tougher for Thika in the return leg. “We were not lucky today because we conceded two easy goals. In the return leg we will do our best to get the win because I want to get back to the Premier League,” the coach stated. Thika, understandably took time to settle into the match with Ushuru having the opening chances. Within the first two minutes, Benson Amianda threaded his way past Thika markers but his eventual shot with goal in sight was awry. Five minutes later, Barrack Odhiambo had an even better chance when he was put through on goal by Patrick Macharia, but his effort was weak, easily collected by Eliud Emase in the Thika goal. Michael Mutinda limped off injured for Thika after just 13 minutes having twisted his ankle on the bumpy Thika pitch. His place was taken by Saad Musa who proved a super sub. On the half hour mark, the midfielder was at the right place at the right time to tap the ball home inside the box after the Ushuru keeper had blocked Chibueze’s shot. Chibueze almost doubled Thika’s lead two minutes later when he sprinted away on the left before cutting in to his favorite right foot but the effort was well saved by the Ushuru keeper at his near post. In the second half, Thika started well and Chibueze had another chance when he was put through by Mukangula at the edge of the box but his short skied. But Thika’s strength faded off as the half wore on, clearly unfit after weeks of lack of training. Only midfielder Said Tsuma tried to put in the yards, clearly fit after national team duty at the CECAFA Senior Challenge Cup. Thika keeper Emase was forced into a brilliant save in the 63rd minute, punching away with one hand a fierce Oscar Mbugua shot from an Amianda cross. Ushuru had pressed the hosts inside their own half, forcing them to defend with their lives. Mohammed Hassan came in for Rosevelt Blaty as Kenyatta sought to go full out attack, looking for that one goal that would seal the tie. Just minutes after coming on, Hassan proved a worthy gamble when he curled the ball home inside the box after Thika failed to clear a corner. Clearly boosted by the equalizer, Ushuru saw space for hitting the winner and probably one more goal that would cushion their lead. They piled pressure on Thika, playing in long balls that saw the home side defend uncomfortably. But with bodies sent upfront, the taxmen were caught off their guard with four minutes left when Saad slapped the ball into Chibueze’s direction, the Nigerian forward taking a one-time shot that was deflected into the net by Kentile. With only two minutes added on, Thika defended well to ensure the result remained and will now need in the least a draw to retain their KPL status. Ushuru have to win by a margin of more than two goals for an outright win while a win by a one-goal margin will send the game to penalties.